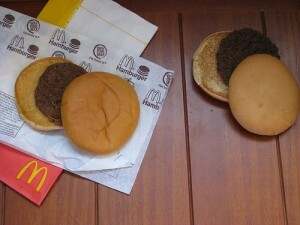 What’s a 12 Year Old Hamburger Look Like? Amazingly, it looks pretty much the same. I had heard you could do this with Twinkies (they have a half life instead of a shelf life), but you might think that “meat” would eventually decompose, draw flies, maggots, mold…something. Back in 1996, Karen Hanaran bought a McDonald’s hamburger and let it decompose — only it didn’t. It still looks the same as it did when Clinton was president (in his first term). You can read the whole story here: Best of Mother Earth.